Take whatever preconceived notions you may have about pool robots and throw them out. The all-new Quantum is here with groundbreaking new technology to ensure that every inch of your pool is cleaned to a whole new level. The Dolphin Quantum was designed to combine optimal convienience and efficiency to bring out the most in your pool while taking up the least amount of your time. There is a reason why the Dolphin Quantum is redefining your robotic pool cleaning experience. In fact, there are dozens. See the features and warranty that set the Quantum apart. For two years, your Dolphin Quantum is fully protected. Period. This bumper-to-bumper warranty ensures that no matter the issue, you are in the best hands. It’s about a new benchmark. We are always looking forward, not sideways, never back. So we started from scratch and gave it everything we had to make the newest Dolphin even better. Our goal was simple. To create the next Dolphin that can do more, deliver more and consume less power than ever before. The Quantum represents the future of the Dolphin brand. A fascinating future that shows what’s possible. Its design is completely new, but like that of every Dolphin that came before, it’s based on years of research and engineering. The all-new Quantum takes its place at the top of the Dolphin line and in the top echelon of its class. The dynamics of propelling a robot straight ahead are simple. There’s nothing overly complicated about movement straight ahead. To appreciate the essence of the Quantum, one only has to observe the remarkable lateral movement of the robot as it effortlessly adheres to the vertical pool surface. This is where Quantum separates itself from every cleaner made before. Equipped with 3D Mobility, Quantum was engineered to ensure that every inch of your pool is deep cleaned. For the first time ever, powerful vortex jets were added sides and top of a robot. The result is the world’s first robot that can move laterally along the walls of your pool. With its superb weight distribution and low center of gravity, the Quantum is engineered from the ground up for next generation mobility. Everything we do day in, day out is geared toward maintaining and enhancing your pool ownership experience. From innovative lightweight materials to new filtration media, to advanced 24-volt DC motors and microprocessors, we’re constantly working to get the most out of every electron. But we aren’t satisfied with just using less energy. The demands of pool owners everywhere are changing and we’re listening. With patent-pending PowerJet 3D Mobility and a level of efficiency never seen before, the new benchmark is set. Highly efficient, state-of-the-art DC motors and gravity defying PowerJet 3D Mobility deliver an exceptional user experience while reducing energy use up to 90%. In a class by itself, the Dolphin Quantum was designed from the ground up to be easier to buy, own and operate. It’s natural to want to keep things under control. It’s natural, that is, if you’re the new Quantum. Long suggested to be part of the ultimate in pool robot mobility, 3D Jet technology has arrived. Instead of the traditional single jet, the Quantum employs three jets in a prescribed way throughout the range of motion. Three jet nozzles produce multiple streams of fast-moving water that combine to create vectored thrust. The patent-pending technology provides constant grip on vertical surface for superior wall and tile line cleaning. As Quantum traverses and climbs the wall, the jets provide the robot with precise control to move in any direction at any time. PowerJet 3D Mobility provides real advantages when compared to conventional pool cleaners. Jet drive propels the robot with vectored thrust, providing unmatched maneuverability. For the first time ever, a pool-cleaning robot has the ability to precisely hold itself in a fixed position against the effects of gravity. As a result, the Quantum’s advanced track driven navigation system can operate to its full potential. PowerJet 3D Mobility provides efficient cleaning along water lines and improves navigation accuracy while enabling escape and avoidance from any obstacle. The new Quantum’s filtration system is so large, easy and convenient, you’ll never consider messy, cumbersome debris bags again. Cartridge filters have been around for years but pool owners found them small and difficult to clean. Previous generation cartridges made debris removal nearly impossible with small cavities that trapped small debris and fine dirt. Consider this problem solved. With the new Quantum, Dolphin introduces a new 400 square inch cartridge with the highest capacity ever recorded on a pool robot. The new Dolphin SnapLoc Filters make robot cleaning easier than ever. All four sides of the Quantum filter simply snap apart for quick and easy cleaning. In addition, the bottom panel is hinged to allow debris to simply fall out during cleaning. For the first time ever, no matter which media type you choose, you won’t be making a compromise. Specific types of media work best for specific jobs. Quantum gives you the power to choose the right micron filter for the job. The quick-change filters allow you to change the media in seconds. Insert the NanoFilter to handle small debris like fine algae down to 2 microns. Choose the standard filter for maximum suction. The oversized filter cartridge is easy to remove and cleanup is faster than ever. Want to find debris and algae that passes through other filters? Go micro-filter. Need to pick up a bushel of leaves? Choose the oversized standard filter option. Virtually any pool cleaner can vacuum loose debris, but it takes a special type of robot to remove contaminants that adhere to the pool surface. Traditional cleaners merely pass over difficult to remove pathogens, leaving them fully intact. The Quantum robot was engineered from the ground up to deep clean. Engineers gave Quantum dual scrubbing brushes that attack the bacteria, algae and biofilm that is firmly attached to the pool wall. The HyperBrush spins two times the speed of ordinary brushes to dislodge even the most difficult, stuck-to-the-wall contaminants. HyperBrush is especially effective against biofilm, a structured community of microorganisms that increases chlorine demand, destroys water quality, and frustrates pool owners. Guided by SmartNav 2.0, Quantum’s dual high RPM brush power scrubs every square inch of any pool with remarkable efficiency. Water in between the wheels and pool surface make it difficult for the robot to maintain traction. Continual slippage results in lost energy efficiency and reduced performance. The Quantum takes a radical departure from the conventional wheel with continuous rubber tracks. Quantum maintains constant contact even when climbing slippery surfaces. No more slipping. No more wasted energy. The rubber track also improves directional control and provides greater force than wheels. Tracked robots also glide smoothly over obstacles like drains and are capable of climbing straight up vertical walls. The Quantum’s traction is further improved with a high grip, water-optimized tread and geometric shape, which minimizes rolling resistance for superior providing superior weight distribution, traction, and wall climbing. Gone are the days of watching your robot aimlessly wander around your pool, wondering if it will ever pick up the leaves it has skipped day after day. The new Quantum is equipped with a SmartNav 2.0 Robotic Scanning to ensure that every inch of your pool surface is reached. SmartNav software delivers highly optimized scanning and coverage for a new level of clean. Quantum calculates the optimal pattern for faster cleaning and improved efficiency. With its remarkable pool mapping system, the Quantum knows where it has and hasn’t been to avoid overlapping cleaning paths and minimize cleaning time. With the ability to sense ladders and drains, Quantum won't get hung up like ordinary cleaners. Microprocessor controlled Pool Scanning ensures complete efficient pool surface coverage. As a leader in efficiency, the new Quantum redefines what it means to look and feel like a robotic cleaner. Its newly designed frame is sleek and low to the ground for minimal water resistance as it moves along your pool’s slopes and walls. The new Exoskel is a minimalist architecture that keeps only essential structural parts. It reduces the weight while creating a strong, modern and cutting edge design that defines the unique abilities. Quantum was given a convenient carry handle that is located near the front for easy handling. A new fast water release system quickly removes excess weight and ensures Quantum remains lightweight and easy to carry, even after a full two hours in your pool. Quantum is equipped with programmable run frequency and cleaning duration so you’re always in full control. With programmable modes, you can set Quantum to automatically run when you need it - daily, 2x per week or 3x per week. Quantum comes with a built-in, programmable weekly timer to ensure that even if you are out of town, your pool stays clean and ready to enjoy. Quantum is engineered to clean quickly and thoroughly. This means you can schedule your robot to run less often. Quantum will complete a cleaning cycle in pools up to 50 feet long in just two hours. The new advanced controls allow you to run Quantum only as needed instead of every day, saving even more energy. There’s a new mandate that guides the engineering principles of Dolphin. Conserving resources while maximizing output. That’s why the Quantum operates on nearly 90% less power than old fashioned pressure side and suction side cleaners. While other pool cleaners can expend a massive 1800 watts of power, the Quantum requires only 180 watts. The newest Dolphin robot requires just 5 cents per hour of operation. Quantum’s dual 24-volt, 3000 RPM DC motors propel its lightweight Exoskel body and dual scrubbing brushes over every square inch of the pool effortlessly, and with a quantum leap ahead in efficiency. This economical balance of power and efficiency is what keeps the Quantum ahead of traditional, power-hungry robots. Its motor lies low in the underbody, lowering the robots center of gravity and enhancing its lateral dynamics. Even weight distribution between front and rear promotes better balance and allows electrical energy to be converted into propulsion more efficiently. But that’s not the whole efficiency story. Quantum’s two hour cleaning cycle means it cleans quickly and thoroughly so it operates less. Adding the Quantum to your pool’s cleaning team means forever changing the way you view a clean pool. The Quantum picks up where other robots leave off with innovative new features that make owning a pool as easy and carefree as it should be. Experience the peace of mind the Quantum can bring you with its limited 2-year warranty backed by the world leader in robotic pool cleaners. It’s time to try Quantum in your own pool for 30 days. If you’re not 100% satisfied, just return it. 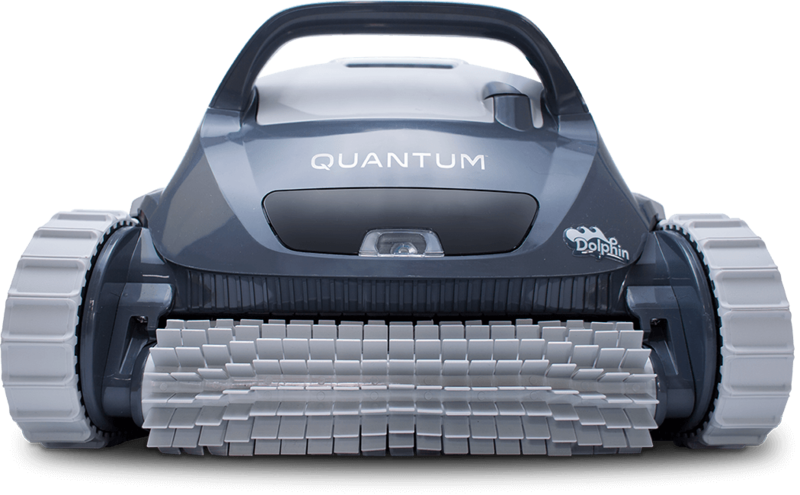 Let Quantum challenge everything you think about robotic pool cleaners.